Princeton, Ky., (Oct. 27, 2017) – Grain markets this fall are suggesting producers should store their corn and soybeans. The question is whether storage is going to pay off. “As fall progresses, producers need to know their break-even price, have patience and watch the local markets for advantageous situations to sell stored grain,” said Todd Davis, agricultural economist for the University of Kentucky College of Agriculture, Food and Environment. The basis for both corn and soybeans, which is the current cash price for the crop at Kentucky grain elevators minus the closest futures contract price, are significantly wider than they have been in the past 10 years. Basis is just one of many factors producers use in marketing their crop, and a wide basis favors storage. However, because it is so wide, some economists are concerned that it may signal less seasonal appreciation, which is when the basis narrows and cash prices gain value against futures contracts. 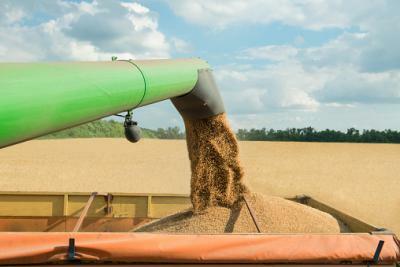 This typically occurs in the spring and early summer and encourages producers to sell their stored grain. Economists expect the 2017 crop basis to follow a similar pattern as it did in 2016 because U.S. farmers have increased on-farm and commercial storage capacity, which will keep supplies high. The basis for the 2016 corn and soybean crops did not increase as much as it did between 2013 and 2015. Without basis appreciation, farmers will have limited profit potential. Knowing all of their input costs including cash rents, their family’s cost-of-living expenses and the cost of storing the crop each additional month, will help producers determine the best time to market their crop. Grain managers should pay particularly close attention to the South American growing season, as it could be an important variable in marketing their grain. Writer: Katie Pratt, 859-257-8774, UK College of Agriculture, Food and Environment, through its land-grant mission, reaches across the commonwealth with teaching, research and extension to enhance the lives of Kentuckians.